Mark Warner talks the walk, in ski boots. RICH GLASS PHOTO. According to the experts, Mark Warner’s Low Pressure Podcast shouldn’t work. We live in a “time-starved society,” they say, a world of insta-everything where information is created, curated, and consumed faster than ever before. A 54-page study, released by Microsoft in May 2015, concluded that the human attention span has dropped to just eight seconds—that’s 1 second less than a goldfish. Warner’s Low Pressure Podcast is an optimistic exception. 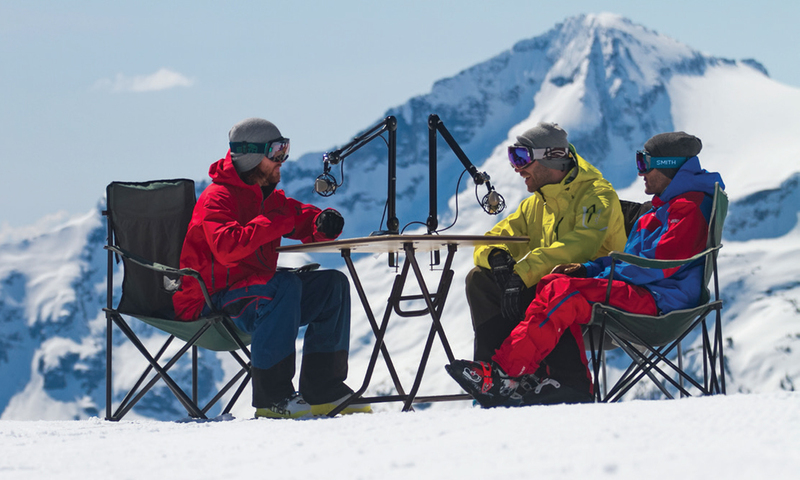 Episodes are anywhere from 45–60 minutes long and feature real-time conversations with some of the most interesting personalities in skiing talking about the joys, trials and nuances of sliding on snow and enjoying the mountains. Mark started planning the Low Pressure Podcast in 2012 after failing to find a good ski podcast online. After a winter of planning and mulling the idea over, the Low Pressure Podcast launched in November 2013 with an episode-per-week schedule over the winter months and sporadic summer sessions. In 40-plus episodes so far, Mark has talked to a wide and interesting cross section of skiing—everyone from Olympians to bootfitters, to pow-chasing pros and more. Produced from his living room in Whistler (or sometimes out in the mountains), Warner says there is no shortage of quality interviews in the Sea to Sky Corridor. With new support from Whistler Blackcomb and Arc’teryx, Mark is looking forward to Season Three. Nor should there be—it’s a goldfish’s world, we just ski here. Check out more from the new Mountain Life Coast Mountains issue here.